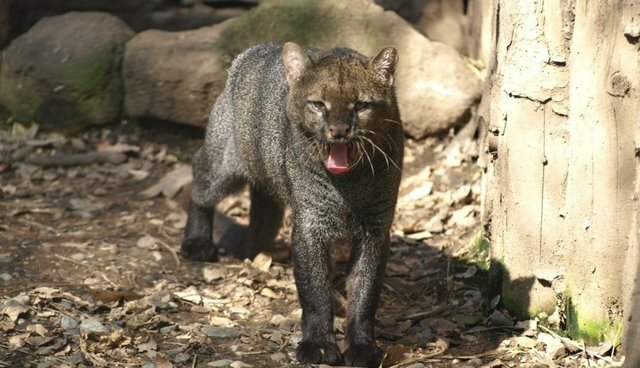 The jaguarundi (pronounced "jagger-OON-di") vanished from the northern part of its natural habitat -- Texas -- decades ago. But the U.S. Fish & Wildlife Service just announced plans to reintroduce the wild cat to the Rio Grande Valley. The jaguarundi is coming home. Though its closest relative is the mountain lion, the jaguarundi is shy and mysterious. It's one of the least-understood cats in Latin America; scientists know hardly anything about its behavior and breeding habits. But we do know that the jaguarundi once ranged comfortably into Texas, controlling the populations of small rodents, rabbits, and birds. After much of its habitat was destroyed, the cat died out there; the last Texas jaguarundi was seen in 1986. The U.S. Fish and Wildlife Service recently said it plans to reintroduce the endangered species, which is slightly larger than a household cat, to the Rio Grande Valley, with the goal of creating a stable population of at least 500 jaguarundis by 2050.